Warning: This product will exceed your expectations! 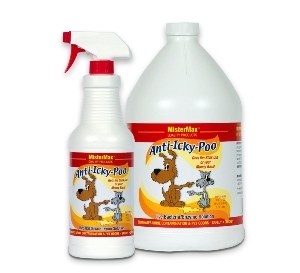 Introduced in 1989, Anti-Icky-Poo is the USA’s most highly recommended product in its category by veterinarians and other animal care professionals. If you have an odor problem, we will guarantee that Original Anti-Icky-Poo will provide the solution, no matter how long the order has been in that location. Original Anti-Icky-Poo has a light floral or spice scent that my wife says smell like Tide Laundry Detergent. Most people like the scent. Just spray it on the affected areas and walk away. Do not rub, scrub, towel it up, pour it and let it pool up (it's very wasteful) and definitely DO NOT MIX WITH OTHER CLEANING PRODUCTS. If you have a more difficult odor problem, re-spray every 90 minutes to 2 hours 4 or 5 times per day for one or 2 days and prevent recontamination. Check the treatment guide for specific materials and situations.